Breathtakingly opulent, this lavish ring is crafted in 9ct white gold for a polished feel. Set with three mesmerising claw set square cut aquamarine gemstones flanked by sparkling diamond set shoulders. Designed to stand out, this statement piece is ideal for formal occasions. 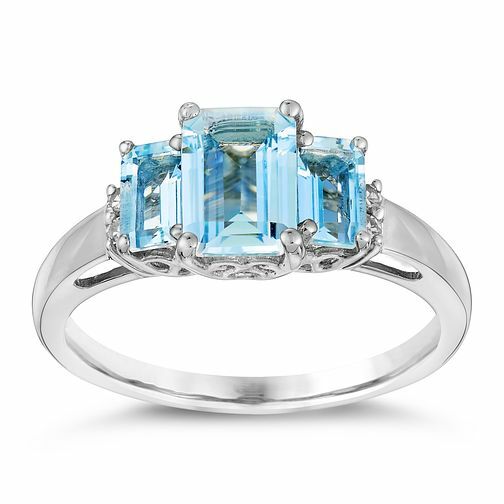 9ct white gold aquamarine and diamond ring is rated 5.0 out of 5 by 2. Rated 5 out of 5 by Anonymous from 40th birthday present This is a beautiful ring bought for me by my husband for my March birthday...I love it, it’s perfect ?? Rated 5 out of 5 by Anonymous from The perfect ring! By my surprise i choose this for my engagement ring and couldn't be happier the online imagine doesn't do it any justice! It's a beautiful ring. The only down side is ernest jones don't stock any sizes and you have to order which mine took up to 6 weeks to be delivered.